These Indian Spiced Chicken Skewers are the result of a challenge I gave myself after being inspired by Briana Thomas. In this blog post, she talks about how it’s quite easy to create delicious S dessert recipes, but indulging in them too often will probably not result in weight maintenance or loss for some people since high fat ingredients like heavy cream, butter, cream cheese, almond flour, and peanut butter, etc., are also very calorie-dense. I’ve also discovered this to be the case, and like Briana, I want to start focusing on creating smarter recipes. This Fuel Pull main dish is the first of hopefully many more conscious attempts to lighter, delicious, on-plan food. My hubby raved about this simple dinner of yogurt-marinated chicken breast and asparagus, and I loved it too, even though I wouldn’t consider myself a lover of Indian food. A bit of cumin, turmeric, paprika, sea salt, ground pepper, and cinnamon combine with 0% fat Greek yogurt to create a low-fat, low-carb marinade with just enough Indian flavor that our young children could still enjoy it even though they’re more accustomed to Dutch/Canadian recipes. Since this recipe is a Fuel Pull, you will want to pair it with a non-starchy vegetable (like asparagus, broccoli, peppers, or cauliflower) to keep it that way. If you’d like to turn this into an E meal, you could add a side of basmati rice, and perhaps some roasted carrots or sweet potatoes. Alternatively, you could turn this into an S meal by replacing the chicken breast with more fatty chicken thighs, and adding a creamy peanut sauce to a stir fry of peppers, mushrooms, and cauliflower. If your chicken breasts have a tendency to dry out during the cooking process, I highly recommend investing in some top quality stoneware baking sheets. They are dream for producing juicy, tender E or FP-friendly chicken breasts every time since they don’t require any greasing at all after they’ve been seasoned. I’ve had my stoneware for 9 years and use it almost every day! A delicious, mildly Indian flavored Fuel-Pull meal! In a bowl, mix yogurt and spices together. Transfer into a large, resealable bag and add chicken breast chunks. Toss to coat chicken and marinate in fridge for 1-12 hours. Preheat oven to 375 F. Line baking sheet with foil or parchment if you're not using stoneware. 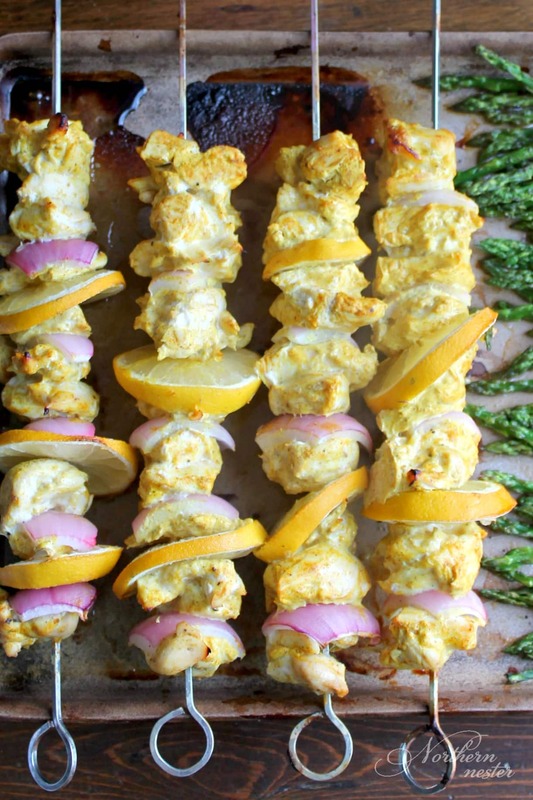 Thread chunks of chicken, lemon, and onion on skewers. You should have enough to fill 4 large skewers. Place on half of baking sheet and bake for 15 minutes at 375. Remove from oven and lay lightly olive-oiled asparagus in a single layer on the other half of the baking sheet and sprinkle with sea salt and pepper. Turn skewers. Return to oven and cook for 10-12 more minutes or until asparagus is tender and chicken is cooked through. Serve immediately. Make this an E meal by serving with rice and carrots. Make this an S meal by serving with a buttery stir fry of non-starchy vegetables. How well do you think the spices would blend with sweet potato? Many Indian recipes call for sweet potato, so I think it would work really well an E meal! It turned out great with the sweet potato. This looks delicious, Jacinda! Thanks so much for the link. I’m humbled to be your inspiration and can’t wait to see what else you come up with! Can I just use garam masala? I don’t want to buy turmeric for 1 recipe.